a) Mowed the lawn while texting. b) Hooked a chain to the steering wheel to pull a dead tree stump out of the ground. c) Became entangled with my children’s swing set and flipped the mower upside down. The embarrassing answer became a new entry for Our Daily Journey, which I post below. One positive from this experience is that I now know I have no fear of death. I remained calm while the accident was happening and after righting the mower and changing its oil and air filter, I put the cutting deck back on and finished cutting the lawn. So apparently I’m ready to go. One negative is that I’ve been telling my son all summer that it’s time for him to begin mowing the lawn. He said he is too afraid and I told him there is nothing to worry about. Now it seems he has won the argument. The other negative is that I’ve lost the moral high ground with my wife. She has a free pass to make any mistake she wants. She could run the air conditioning with all the windows open, put a humidifier and a dehumidifier in the basement just to see who wins, or bring home only the front half of a buy one/get one free offer. If I protest, all she has to do is raise an eyebrow and ask me about The Incident. I’m not sure what the statute of limitations are for these things, but I’m about to find out. If you think you are standing strong, be careful not to fall (v. 12). I didn’t stop to throw the swings over the crossbar. My wife would have, and for good reason. Last month she popped a wheelie when a swing hooked the bottom of our riding mower and lifted the front tires off the ground. I couldn’t believe she had been so careless, and I hoped she had learned her lesson. Her scare reminded me to slow down to first gear as I maneuvered around the swing on my left, but I didn’t see the one on the right that caught. The mower reared up on its hind wheels then tipped backwards. I hit the ground and rolled out of the way, stood up and stared in disbelief. 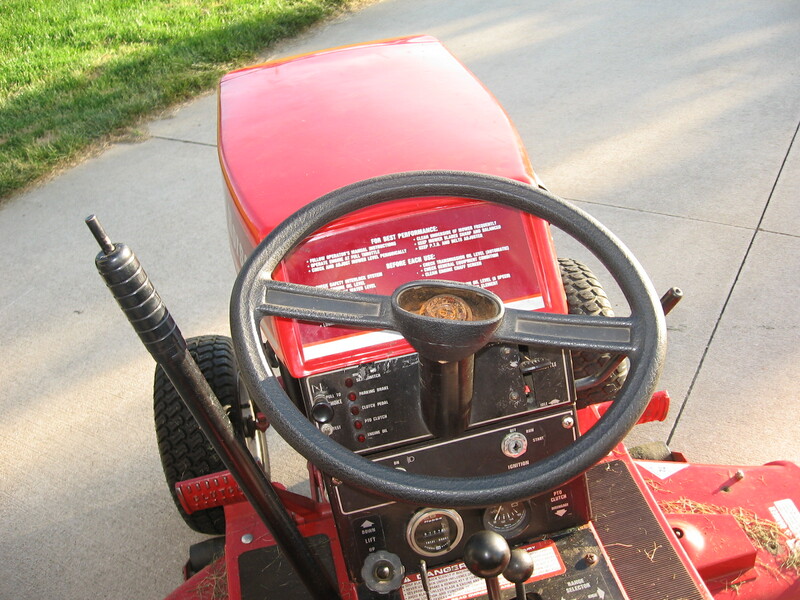 I had flipped my riding mower, which now lay upside down on its crushed steering wheel. My wife couldn’t believe I had been so dumb. After what had happened to her, how could I have been so careless? But that was the problem. It had happened to her, a rookie driver. I had mowed my lawn for eight years without incident—I didn’t even know it was possible to flip a riding mower on level ground—and I didn’t believe it could happen to me. And so I fell, embarrassingly and dangerously hard. I didn’t learn from my wife’s example, but Paul says I must learn from the Israelites’. Their stories of disobedience “were written down to warn us” not to “crave evil things as they did, or worship idols,” or “engage in sexual immorality,” or “put Christ to the test,” or “grumble as some of them did” (1 Corinthians 10:6-11). We are worse the moment we suppose we’re better, for we become sloppy when we think we’ll never fall. If “pride goes before destruction, and haughtiness before a fall” (Proverbs 16:18), then we must fear our strengths. What sin are you sure you would never commit? Look out! You’ve just let down your guard. I always leave just before it gets interesting. Gary, I am taking your comments as gestures of sympathy and goodwill, as I’m sure you intend them. I didn’t take any pictures of the upside down mower, because I was in shock and thinking I had wrecked it. I was too concerned to get it back on its wheels. It was a strange sight, but I’m guessing that in your day, and given where you’re from, you’ve seen a few. The surprising thing is that the mower still works. A couple parts fell off in the ordeal that I’m not sure where they go, but they must not be important, because I mowed last night and it drove fine. Before you take your wrath out on the innocent swingset might I suggest keeping it around after the kids have outgrown it. I have re-purposed mine, along with a hand winch, to deliberately lift the front of my mower in order to sharpen the blades with an angle grinder, or work on the underside of the mower. No need to purchase one of those expensive mower lifts at TSC. Jack: You mean you can’t be bothered to take the deck off? That attitude is precisely how I flipped mine. I’ll see you my swing set for $300 (brand new it’s $1,200)–I think you’ll enjoy the tiny climbing wall. I suspect our old set was given to us when someone else was done with it. As for taking off the deck, when you are my age you will most likely also look for ways to avoid crawling around on the ground and pulling pins and clips. Now I simply slide under it and grind away. And at $300 for a used set, that is closer to what I spend on a used car. Jack, you apparently have forgotten what I drive. I’m not trying to sell you my swing set, I’ll look for someone who loves their grandchildren and lives in East Grand Rapids. Getting back to your main point, I suppose I am too wrecked to fall for a battle over whose car is a bigger heap. Then again, speaking of EGR, I am afraid to drive one of my vehicles there for fear of being profiled. See those sheep on your header pic? Buy them. Did you consider that your accident was actually God’s punishment for having (letting?) your wife cut the grass? There is no statute of limitations on husband screw ups, but heaven help you if you violate the statute on wifely mistakes. And as a husband who has frequently found himself in a Tim Allen-esque situation, I can tell you that you “get out of jail free card” is to remind your wife that, yes, you do stupid things – you are a guy – but what’s her excuse for marrying you?